Hear the gentle sounds of a small gentle brook as water cascades over smooth boulders and meanders its way down through the green swaying meadow. The sound of running water is very calming to babies. It is one of nature’s natural white noise sources and provides a simple soothing calming and delightfully relaxing sound. At home, you can find a similar sound and effect by running water in the bathroom or kitchen. However, why waste all that natural resource when there is a much easier method of providing the same soothing sounds. 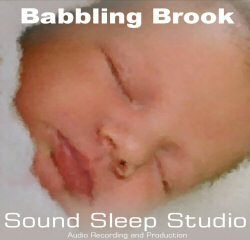 Our Sleep Sound Baby Babbling Brook sound provides all the benefits of listening to the original natural stream but without all the hassles. Together with the random splishes and splashes, we have digitally captured the true sound of a hillside stream to provide a high quality environment changing recording. Additionally, as you play the sounds, you can individually alter the volume and tone settings to provide the exact level to suit your requirements. Babbling Brook is available as a simple MP3 download. The MP3 can be played directly from your computer or via any MP3 player. You can be playing this soothing sound to your baby in just a few minutes and embark on a journey of more relaxed sleep times.